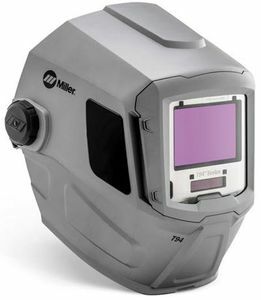 The Miller® T94™ welding helmet features Miller's ClearLight™ auto-darkening lens technology that provides a bright, crisp, clear view of the weld puddle. The T94 is designed to perform in high-heat*, industrial welding applications. The matte silver finish reflects heat while the aluminum heat shield protects the auto-darkening welding lens. The lens operates in Weld, Cut, Grind and X-Mode™, which is ideal when welding with low amperage DC TIG, with obstructed views of the weld arc or while welding outdoors. It is capable of DC TIG welding down to 3 amps and has four arc sensors. The lens also features external grind controls, which means you don't have to lift the helmet to switch from welding mode to grinding mode. The T94 helmet shell comes standard with shade 5 side windows to improve peripheral vision while welding and easily accommodates a Miller half-mask respirator under the hood. Weight: 21.1 oz. (598 g) - Lightweight, well-balanced design reduces neck torque, minimizing operator fatigue and strain. Shade 5.0 side windows enhance peripheral vision, amplifying sense of surroundings. Chiseled shell design provides optimal skin coverage while easily accommodating a Miller® half mask respirator. Helmet locks in upright position, allowing user to keep helmet on for non-welding tasks. Simplistic digital lens interface allows for easy adjustment with or without gloves. External grind controls allows quick switching from weld to grind modes and back without lifting welding hood. *May not be suitable for some amperage/temperature extremes. FREE Miller® Classic clear safety glasses. FREE 2- Pack Miller® disposable welding respirators. 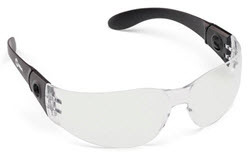 Miller® Classic Clear safety glasses are lightweight, economical and feature an anti-fog coating. Classic Clear safety glasses have frameless design and are comfortable enough to wear all day. Glasses also feature adjustable temples for a precision fit. Miller® N95 disposable welding respirator removes up to 95% of airborne particles associated with most common welding operations. The Miller N95 respirator is suitable for use when welding on steel, stainless steel (hexavalent chromium), galvanized steel (zinc oxide), steel/manganese alloys and aluminum. It is also effective for removal of cadmium and lead fumes. Cleaning & Maintenance: Do not use the same respirator for more than 8 hours, continuous or intermittent, in dirty workplaces that could result in high filter loading. The maximum service time of this respirator is five (5) consecutive calendar days (including days of non-use), beginning from the first day of use. PLUS get a $50 Build With Blue™ Cash Rebate from Miller® with the purchase of a T-94™ welding helmet AND get up to an additional $200 Cash Rebate when you purchase qualifying Miller® or Hobart® branded accessories (excludes welders and plasma cutters). Download Build With Blue™ Rebate Submission Instructions HERE. All rebate forms MUST be submitted electronically to Miller no later than July 15, 2019. Offer expires 6/30/19. Heavy duty backpack designed specifically for welders. GB100 is excellent for safely storing and carrying expensive welding helmets. Miller® T94™ welding helmet bib adds additional neck protection to your T94™ series welding helmet or T94-R™ series PAPR. Genuine Miller® T-94™ Light Kit mounts directly to your Miller® T-94™ Series welding helmet and features two high intensity LED flashlights rated at 70 Lumens each. Package of 5 Genuine Miller® replacement outside cover lens for your Miller T94™ or T94i™ welding helmet. Pkg of 1 - Genuine Miller® T94i™ replacement clear grinding shield for your Miller® T94i™ or T94-R (PAPR) welding helmet ONLY. Pkg of 2 - Genuine Miller® T94™ Series side window covers for your Miller T94i™ or T94™ welding helmet ONLY. Genuine Miller® Generation IV replacement headgear for your Miller® T94i™ or T94™ welding helmet ONLY. Genuine Miller® replacement front lens holder for your Miller® T94i™ or T94™ welding helmet ONLY. Genuine Miller® T94™ replacement auto-darkening lens for your Miller T94™ welding helmet ONLY. Does the xmode works for the light bulbs indoors? Miller advises that the Miller T94 Welding Helmet 260482 should not be affected by indoor lights when in x-mode. When u put xmode, do u still can adjust the sensitive ? Sensitivity can not be adjusted when the Miller T94 Welding Helmet 260482 is in x-mode. can I swap the headgesr out for an older style since in most reviewes the headgear seems to be a possible issue. Miller advises that the Miller Welding Helmet Generation IV Replacement Headgear 260486 is the only headgear that will fit in the Miller T94 Welding Helmet 260482. Miller T94 Welding Helmet 260482 serial numbers is located on the side of the auto darkening lens. Will this fit in the hood pouch on the BSX Welder gear pack? Can I get a halo for this or does it need to be worn without a hard hat? Miller Welding Helmet Slotted Hard Hat Adapter 259637 would be what you need for putting a hard hat on the Miller T94 Welding Helmet 260482. Miller Welding Helmet Slotted Hard Hat Adapter is compatible with most major brands of slotted hard hats. Blades mount inside the welding helmet and slide into hard hat slots. Why does it say might not be suitable for some amperage/temperature extremes? Haven't noticed that before. Miller T94 Welding Helmet 260482 has polymers in the helmet that are rated for 131 degrees fahrenheit. Some amperages may put the temperature of the weld area above the 131, compromising the helmet. Does this Lens have an Optical Clarity rating of 1/1/1/1 ? Miller advises that they do not have an optical clarity rating on this helmet. What is the differences between the T94 and the T94i ? The main difference is that the Miller T94i has an Integrated grinding shield with 44 square inches of viewing area. The Miller T94 Welding Helment 260482 is only available in silver. This miller does has an excellent view but the head adjustment is crap! It falls down too far if I have it a lil lose, it'll come down to where I need it if its too tight. Don't really like this helmet much. Seems like its made for people with a more than normal wide face. Love the hood and lens but the headgear is crap! I've been working with a miller 9400 titanium with shield. This hood is a huge improvement, first the clarity WOW! if you can see better you can weld better. The weight is a lot better. I love the side shield addition. I'm often welding around mobile equipment, and its much easier to see them coming. A huge safety bonus. The headgear is redesigned, it spreads the load better and its easily adjusted. 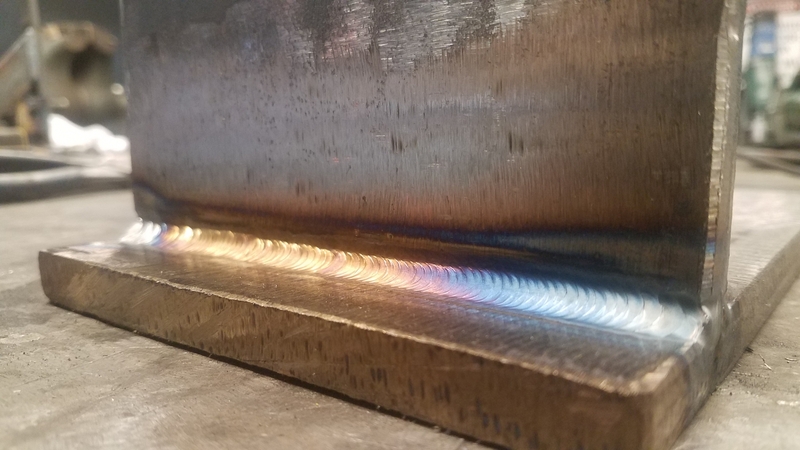 I've been welding forever, 20 years and its my opinion this hood is worth EVERY penny. Prosclarity,weight,extra side shield viewing area. The miller t94 is by far the best helmet I have used. I work in the collision industry and have to weld with steel. Mig brazing. And aluminum. This helmet has such good clarity I can see the end of my wire as it melts away. Also has the most comfortable head gear of any helmet I have tried. I have welded for testing that has required me to be welding or preparing for welds for 6 hours at a time this helmet does not leave me feeling a lot of strain on my neck or forehead. I would recommend this helmet to everyone I know. The side lenses are also more helpful than I thought they might be. Definitely thought it was to good to be true considering the sale price. But I decided to take a gamble and give cyberweld a chance. They did not disappoint. The T94 has been worth every dollar and have had zero issues. over the old version but like the old one it will be the first thing to break. The lense is incredible. I can see MUCH better with the T94 helmet but am still frustrated with how it fits on my head and getting the right tension on the "up" see. and "down" weld. My cheapie charley harbor freight does a much better job. If the tension on the T94 is too loose - it falls down when I do not want it to. When I tighten it up I also have to tighten up the head band until it is very uncomfortable. Seems to me there are TOO MANY adjustments on this helmet. Better instructions are needed. Incredible helmet. I didn't realize how out of date my 15 year old sensor was until I used this helmet. 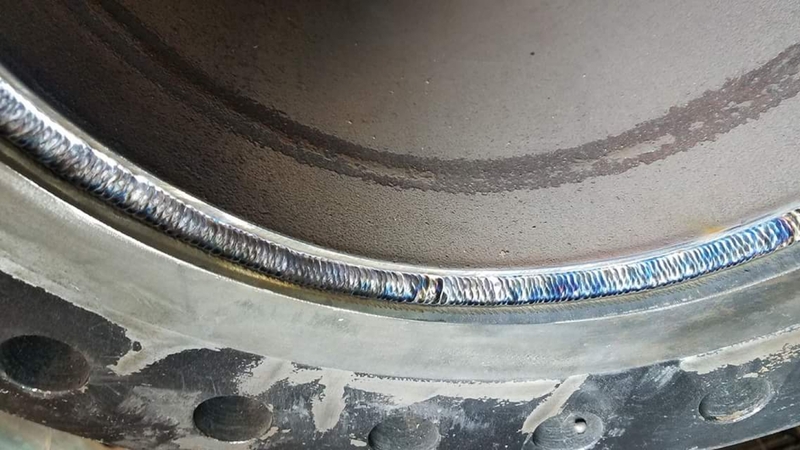 As a non-professional welder it is helping me SEE the errors and correct the improper techniques I had been using over the years. I love this helmet, its light, has the side windows which are really nice when you need to be aware of things going around you. ProsThe helmet is balanced and very light weight. The lens has Good color for welding and brazing. ConsActual head gear adjustment band seem like they are a little fragile. I had been eyeing this for months, having used a couple sentinals and the new lincoln hood buddies had I really wanted a hood with a bigger viewing area and different arc color than green. I use a miller elite at work and figured I'd pick up the T94 for home projects and mainly ac tig. Right out of the box it works great, the picture is amazingly clear, the side shades are nice and give you more of a complete view of the area you're welding in. I could understand how light from another welder near you could be distracting but they do sell side shade covers. In my personal opinion I think the more natural arc color is less straining on the eyes. Seems to lighten everything up around the puddle too, easier to see the joint you are welding. Head gear is comfortable, I haven't used it for a long period of time yet but to be honest I don't think I would notice a difference between it and the elite. Compared to the sentinel and lincoln I'd say they're all pretty close, I'm sure the lenses (a couple are provided w/ hood and a helmet bag) for the miller will be cheaper since they're smaller. Other than that the interface is a bit more user friendly. ConsOnly comes in silver? Wheres the blue! If youre buying a Miller spend the extra money its worth it. 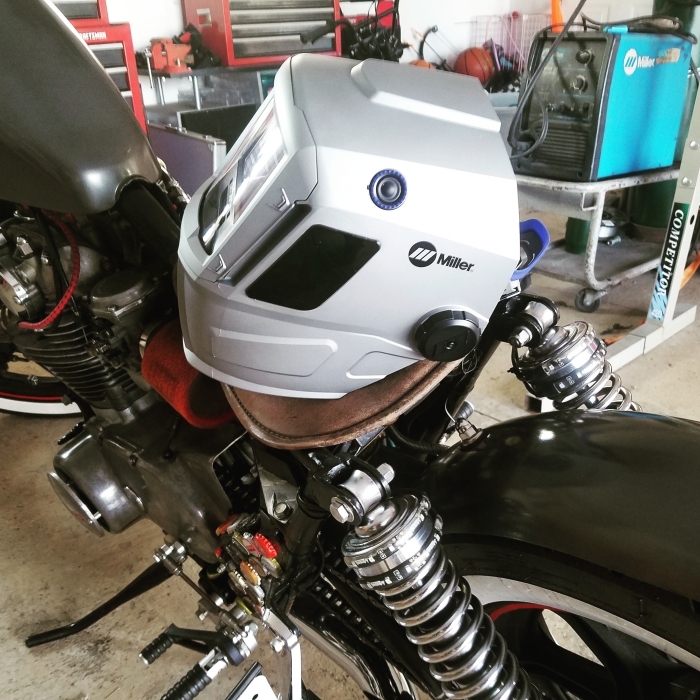 I had been using a not-cheap auto darkening helmet for MIG and it was reasonably effective. But when I started to learn TIG, that helmet provided virtually no visibility. The T94 helmet is far better, allowing me to see the weld pool, dip the filler rod, etc with much better visibility. My optimism about learning TIG is much higher. The only fault I feel worth passing on is the headgear. While it has several head straps and adjustments and is comfortable, I feel that it could be improved so that raising and lowering it could be easier. I have been using a miller elite for the last 5 years, I decided to upgrade. I love this hood! I love the side lenses, it took a little bit to get use to but its great! The color of the lens is unreal! I love how the weld puddle is grayish blue and looks so clear, it's so much better than the old greenish lenses! If you're thinking of buying one just do it! Cyberweld was the cheapest that I could find and they were super duper fast with shipping, it arrived a day sooner than expected. ProsLight weight- easy grind mode .. I've had the opportunity to use many different helmets in the 7 years that I've welded. This is by far the best one I've ever used. The viewing area is a good size and the side windows make you feel like you aren't so enclosed. Plus this helmet is light, I was expecting it to weigh noticeably more than it does. When I have it flipped up, the design is so ergonomic that I hardly know that I'm wearing it. I've had other helmets that strained my neck when flipped up, but not this one. In addition to these features I also really like the comfortable headgear. Now my coworkers want one too. ConsThe only thing that might happen (which hasn't happened to me yet) is there might be a risk of getting flash burn through the side windows if you are welding next to someone. They are a shade 5 which may be enough to protect indirect arc flashes, I don't know though. Just something to consider when purchasing this helmet. I love this hood. The headgear is so comfortable. The shade of the side lenses are nice. Wide view. Many options. I use it for very fine Tig welding, it let's a lot of detail be seen that I couldn't see with my old helmet. Great purchase. I've tried out as many hoods as I could get get my hands on, my current hood for the last couple years has been the Jackson Balder bh3 wich boasted the highest optical clarity rating of any hood available and was a pleasure to use. I bought the t94 with skepticism that it would have any more to offer than the bh3, especially after being disappointed in the Miller infinity hood I bought, and now my bh3 sits in a box as yet another back up hood. The comfort of the t94 is amazing, the lens even better. You could do a crossword puzzle while wearing it in a low lit room. I even have it set darker than I ever ran with other hoods because I can still see the weld better without needing the extra brightness. Plus it looks awesome, (my bh3 I always found kind of ugly) I've let most guys at work try it out and every one of them wants one as their next hood. After 20 years of welding this hood makes me feel like I have been welding in the dark. The clarity is amazing. I have been using Miller hoods for the last 10 years and this hood will keep me using them for years to come. Thanks! This hood works great, comfortable headgear, large viewing area, lots of adjustments for shade, grind, cutting, and x mode. The auto-dark lens works so fast you never see any arc flash. I wish miller had made this hood 30 years ago. First time buying anything from cyberweld. Price was better than anywhere else I could find. The hood showed up right on time. I am a speedglas guy and this lens is so far more advanced and the clarity is amazing. The hood it self is kinda wide but not very long like all the older miller hoods. I would recommend this hood to everyone.